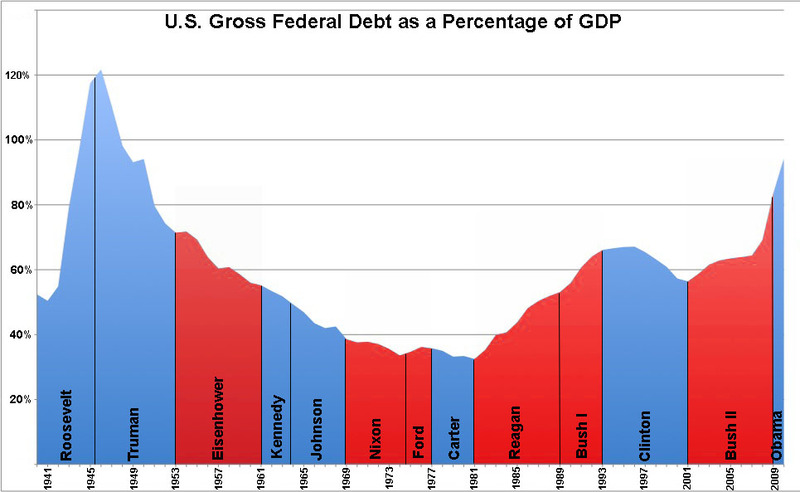 Much of the debate surrounding the U.S. federal debt has been impending doom, at some point in the future, without an adequate understanding of when and how that debt was accumulated in the past. Steve Benen suggests a stroll down memory lane in order to provide some perspective. What his timeline suggests is a relationship between presidential administrations and the debt: Republican administrations promise balanced budgets and actually adopt policies that lead to large deficits while, during Democratic administrations, Republican legislators howl about deficits and the debt to GDP ratio actually falls. Readers will see a strong correlation between rising inequality and rising federal debt over the years. Why? 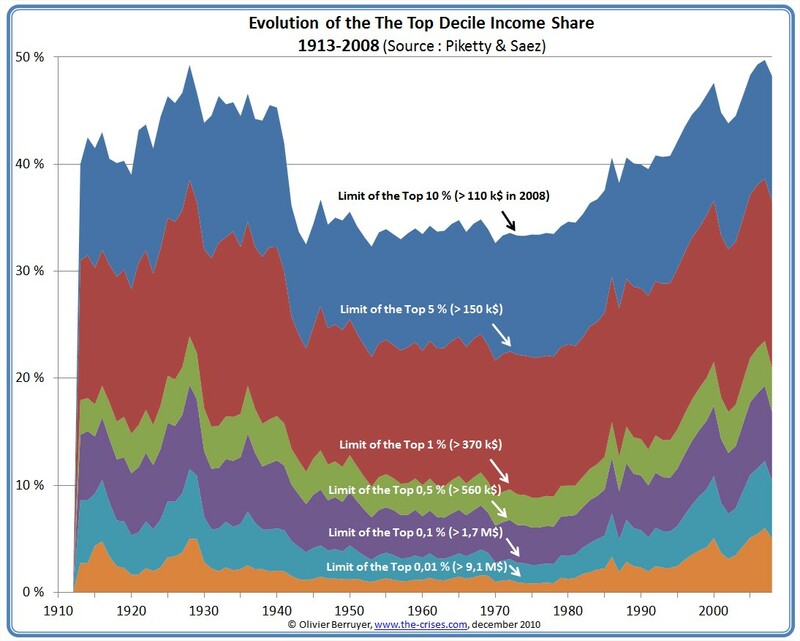 The trickle-down form of capitalism that emerged in the mid-1970s and developed over the course of 35 years demanded increased government expenditures (to fight wars and finance social programs) and yet lowered tax rates on wealthy individuals and giant corporations, who then lent their savings to the government to finance the debt. 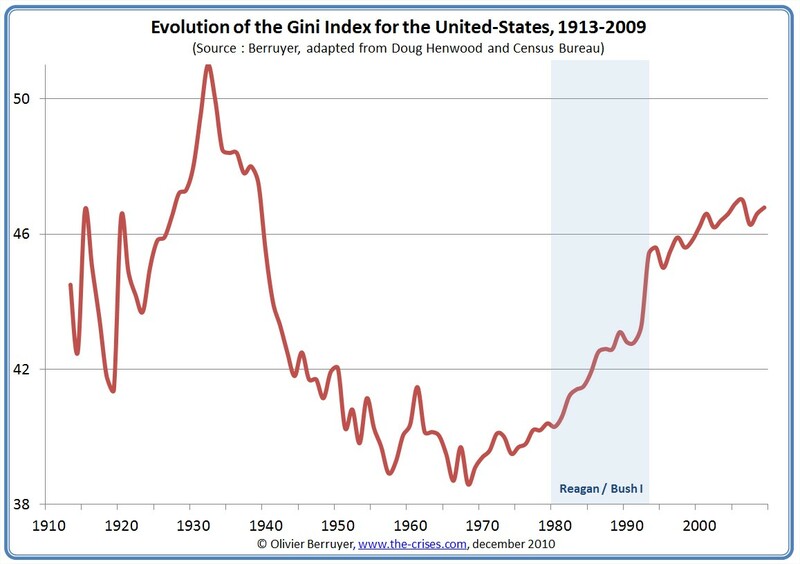 That same trickle-down economy, which created the conditions for the crisis of 2008, led to lower tax revenues and more government expenditures (in the form of government bailouts and for a time extended unemployment benefits, in addition to the ongoing wars) but no change in the unequalizing pattern of trickle-down capitalism that created the problems in the first place. We are left, then, with a distribution of income that is even more unequal than before the crisis, rising government debt levels, and an agreement to cut government programs with the same economic and political groups that supported the run-up in debt over the course of three decades. How, then, should we respond? One approach is to argue against the importance of the debt (in the name, for example, of modern monetary theory). Another is to take seriously “their” calls to restore fiscal sanity and to shift the argument against them by demanding that those who most benefited from the growth of the debt over the years in the name of trickle-down capitalism—the tiny minority of wealthy individuals and giant corporations and banks—pay their “fair” share of the growing deficits. And, if they won’t, we’ll move to Plan C. . .
Not a good summary statement. It’s one thing to point out that MMT hasn’t made very much of the connection to inequality trends, but the MMT approach hardly denies the “importance of the debt.” MMT as I understand it in fact stresses the crucially important role of public deficits (rising public debt) in sustaining private sector attempts to *reduce* debt after a period of private net dissaving.